I hope that two lip product blog post in a row is able to show that i am a lip product addict! Anything from lip balms to lip stain will totally catch my eyes. (before i start going on how much love lip products, i should start the review) For the past year, every single beauty company came out with their own kind of lip stains from glossy to matte. 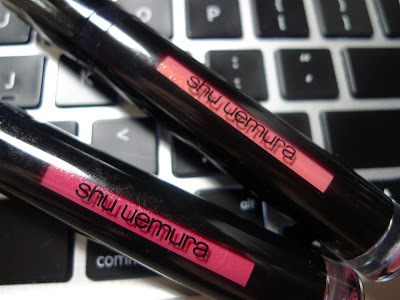 Shu Uemura came out with these laque supreme shimmer recently and they are totally amazing! They have these ultra-fine crystal gold-silver pearls that just sparkle up your day. It create a one-of-kind shimmery finish with a glamorous dimensional effect to achieved a deep yet vivid color across the lips! The sleek packaging just make it perfect to carry around for touching up the glam on the lips! PK 07S Fuschia Sequin: This is a EPIC beautiful bright pink that have lovely gold-silver shimmer. This ultra fine pearls doesn't really show up on the lips, it just creates that glamorous dimensional effect. It leaves a nice pink stain after 2+ hour wear off through eating and drinking. This is the kind of lip stain that can reapply after it wear off without it looking or feeling weird on the lips. A single layer just perfect for a natural look while layering it for a vibrant bright pink that is just perfect for a glam day or night! CR 02S Pearly Rose: This is a easy to wear coral-rose color the just the perfect everyday wear for school and the office or anywhere in general. You could see the ultra fine gold-silver pearls on this color, but it just creates that shimmery glamorous yet natural look! Overall, these are beautiful chic and sleek vibrant lip stains. 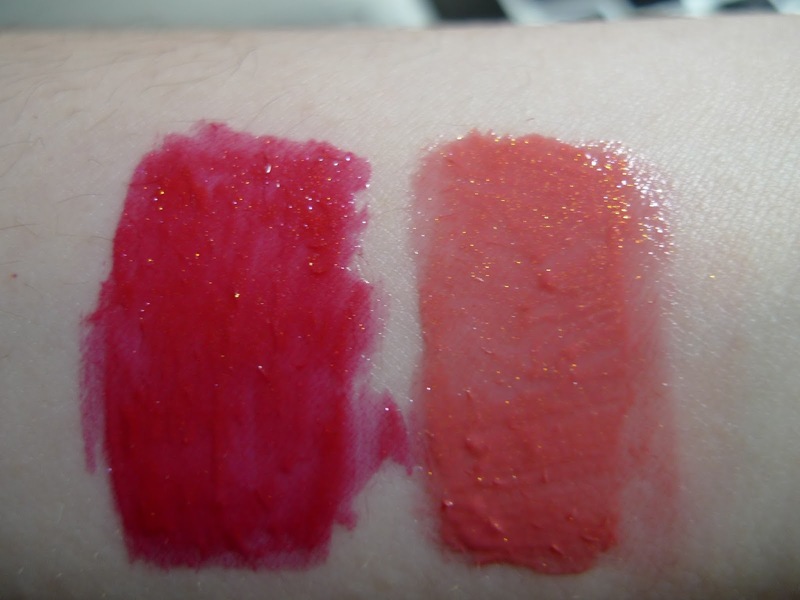 There are total of 8 color ($30/each) in this laque supreme shimmer line for sale on their USA website. I already have few other colors and some other products already added to cart. Hopefully they will open a counter here in NYC, so i could test out some of the products on site. These lip stains are definitely a hit, so grab them online soon!